A regular excursion was just down the road to Ashley Dene, which has been a research farm for more than 100 years. 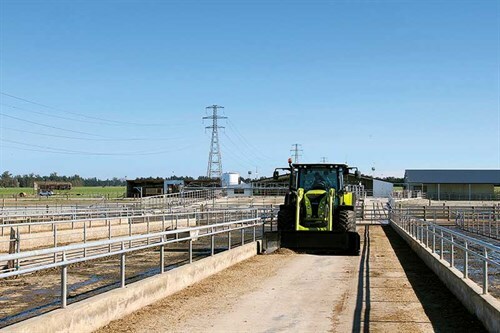 As a source of invaluable data, when I was studying, Ashley Dene was a dryland sheep farm but following the trend in Canterbury, part of the farm has recently been converted for dairy research. CLAAS Landpower New Zealand, the importer of CLAAS , has generously supplied the farm with a couple of tractors and other machinery required. So it was a return to old stomping grounds when I headed to Ashley Dene to catch up with Dave Knowles from Landpower and check out the new CLAAS Arion 620 CIS. The latest CLAAS Arion 620 CIS is powered by a six-cylinder 6.8-litre PowerTech engine, putting out a maximum 158hp. This engine is well proven in other machines for its reliability and as being virtually bulletproof. 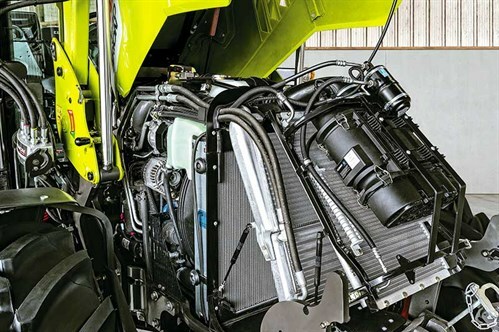 CLAAS has developed the software that controls the engine, and uses a variable geometry turbo to give more torque across a wider engine speed range to improve productivity and save fuel. Emissions meet the Tier 4 interim standard. With exhaust gas recirculation and a diesel particulate filter, burn cycles to clean this filter are automatic and barely noticeable, other than a light on the dash and slightly high rpm for a short period of time (although there is a button to delay it if the timing is unsuitable). So for now, there is no AdBlue requirement, which is a bonus in my opinion, although a Tier 4 final model is on the horizon that will most likely require it. Servicing is easy, thanks to the improved large single-piece bonnet that opens without tools and lifts clear of the engine for easy access. A cooling pack opens out on gas struts by simply unlatching two clips for excellent access for cleaning. Service intervals are 500 hours on the engine and 1000 hours on the transmission. Like most manufacturers, they suggest genuine oils should be used and the engine should be serviced at least yearly if less than 500 hours are being clocked up. Fuel tank capacity sits at a healthy 270 litres. The CLAAS Arion 620 uses the same Hexashift transmission that has been around in CLAAS tractors for some time and so will be familiar to many. This is essentially a 24-speed powershift with six gears in four ranges and no requirement for using the clutch. Even when changing ranges, just tap the short gear lever forward to change up a gear or push it further forward to jump up a range. This is simple and also speed matches to the optimum gear when changing ranges. There’s also an automatic mode with two driving choices. In the field position, it automatically shifts gears up and down in the range as required, and in the transport position, it changes through all gears and ranges in the gearbox as required. This is a great feature. and essentially, when it’s on and the brake pedal is pushed, the tractor electronically disengages the clutch to stop the tractor. 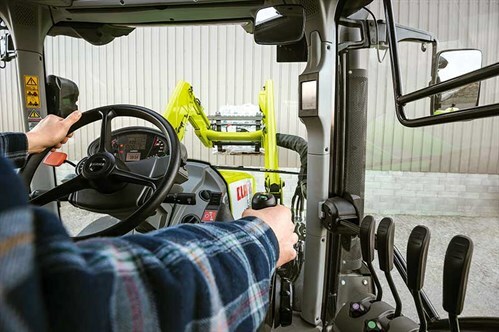 well in stop–start operations such as loader work or round baling. The five-pillar cab gives the best of both worlds: great visibility out the right side along with good accessibility and an opening window on the left side. Four-point mechanical cab suspension gives an excellent ride. Once in the cab, there’s plenty of room with a comfortable spot for both operator and passenger. Visibility is good out the front and rear. Controls are well laid out, with most found on the right armrest, including gearshift, linkage, engine speed controls, and the loader joystick. Anything not found on the armrest is within easy reach on the right console, including mechanical remotes and four wheel drive/diff lock. 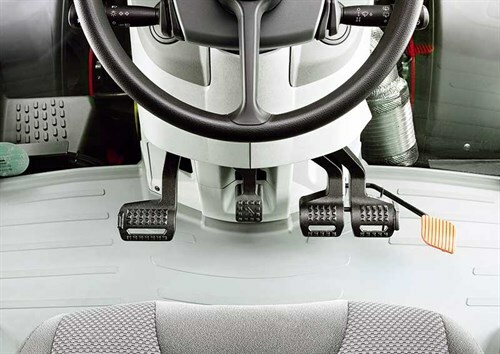 Buttons to select from the impressive four rear PTO speeds are found on the rear cab pillar. The CIS screen on the right front pillar has been upgraded to a seven-inch colour screen. This displays information such as the direction of travel, gear selected, linkage height, and forward speed. More importantly, it gives access to change settings such as smart stop on/off, the flow rates on the electronic spools, and whatever the F3/F4 buttons are set to control. There’s also a simple headland management system that can be programmed, as well as preset engine rpm buttons. Air-conditioning lights and a Bluetooth radio are located in the roof panel. First impressions around the backend are that everything is well laid out and uncluttered. Three sets of mechanical remotes are standard, with an option for a fourth and it’s great to see improvement here. They are paired in order from left to right and colour-coded to match the levers inside, making it simple to couple up external hydraulics. All use high flow couplers with release levers to make uncoupling easy and have adjustable flow rates with four positions for float, neutral, and pump in either direction. This is great to see, as is having power beyond and trailer brakes as standard. 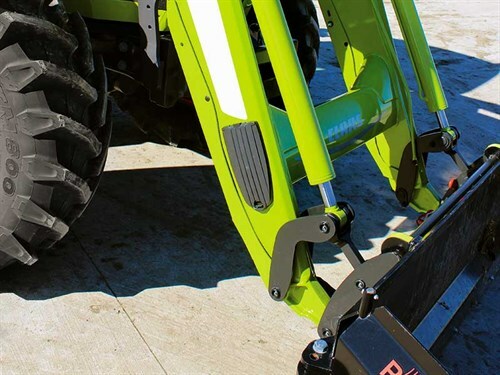 As well as the standard clevis drawbar hitch, there is a piston hitch, which allows heavy trailers to be coupled as close to the rear axle as possible for the best weight transfer. The three-point linkage uses Cat 3 quick link arms and has an impressive lift capacity of 6.9 tonnes. 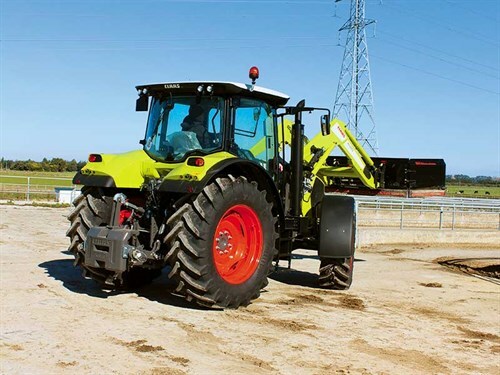 As standard, all Arion 620 tractors are now equipped with a factory-fitted loader. 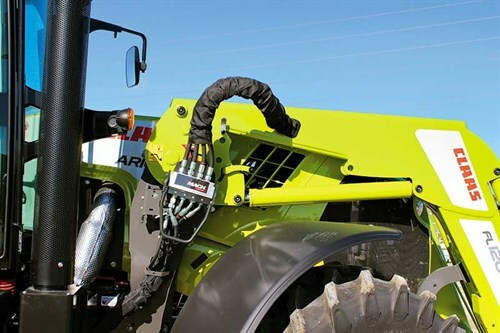 Well-built, it fits the tractor well with built-in features, such as boom suspension, a third service, and a mach quick coupler for the hydraulic hoses. Although not fitted, hydraulic self-levelling is available as a retrofit that simply sees another ram added. If fitted, it has two settings: one to maintain the level of the attachment as it’s raised and another with a seven-degree roll back as it’s raised. The loader uses an electronic mid mount valve and an electro pilot joystick, giving smooth seamless control over loader movement. 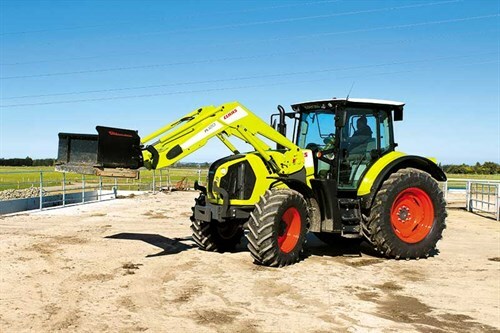 The flow rates and therefore the speed of the loader actions are easily adjusted from in-cab to suit the operator. 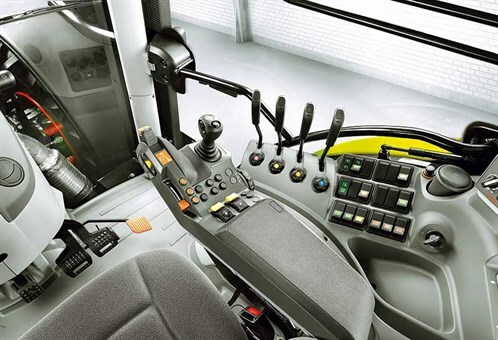 F3 and F4 buttons on the side of the joystick, which control the third service of the loader, are also configurable to a variety of different functions. The most impressive of these, in my opinion, is the ability for F4 to be set as the forward/reverse, which is useful when using the loader. For me, CLAAS tractors are one of the few brands I have never spent hundreds of hours driving. Every time I climb into one, I’m impressed with the feel and layout of the cab, and even with the limited amount of time I’ve spent in this range of tractors, it always feels familiar. Everything tends to be where you remember it, which is a great trait to have, and the new Arion 620 is no different. For a six-cylinder 160hp tractor, it doesn’t feel overly large and was surprisingly nimble when we used the loader to scrape the feed pad on the day of the test. Features such as smart stop and the ability to programme direction change onto the loader joystick worked well in the situation. It’s definitely more than just a loader tractor. It’s an all-rounder that would be equally well suited to cultivation and drilling or baling and feeding out. Click here to check out the CLASS Arion 620 CIS in action.